My wife and I, both physicians in our early 40s, have been in practice for about nine years. Like many doctors, we have days that remind us why our profession can be so rewarding. Unfortunately, those days are being whittled down to moments, while the headaches are inexorably overshadowing the good stuff. We think about retirement on an almost daily basis (I spend way too much time pouring over WCI’s archives). While not the healthiest mindset to maintain, it is our reality. So what are we doing about it (besides trying to focus on the positives and living for vacations)? We Are “Super-Saving” For an Early Retirement. I don’t know that there is a universally accepted definition of super-saving, but I think anything over 30% of gross income could qualify [Remember 20% is supposed to be “normal-saving” for doctors-ed], while over 40% is starting to get fairly aggressive. My wife and I invest approximately 50% of our gross income. Despite starting our investing lives in residency, about 15 years ago, with a tiny portfolio and a negative net worth (each with six-figure med school loans), we now have a portfolio worth $3.4 million. So, what’s the purpose of this post? It’s certainly not to portray our portfolio as a shining example of something to duplicate. We’ve been very slow, over the years, to learn about things like expense ratios and what type of account in which to hold bonds. And all of our naivety is evident in our inelegantly constructed collection of investments. We’re not nearly as financially savvy as WCI (not even in the same universe, let alone league). We’re not even as knowledgeable as the majority of the readers who post comments on this blog. The purpose of this post is to demonstrate what a high savings rate can do in a relatively short period of time, even when you spend the first 3/4 of your investment life feeling your way around in the dark. My hope is to inspire those who read this blog and think: “There is no way I can replicate what WCI and his savvy minions (that sounds a bit evil; it’s unintentional) are doing to secure their retirements.” I’m telling you yes, you can do it. Asset allocation and all the other wisdom on these blog pages is extremely important, BUT splitting hairs on the funds in which you invest is often less important than is your rate of saving. Nine years ago, fresh out of fellowships, my wife and I earned a combined gross income in the low $400k’s. Over the years, that has climbed to a combined gross of almost $600k. I expect that we will fluctuate between the high $500k’s and low $600k’s for the rest of our careers. As I type this and look at the numbers on the screen, it sounds like a LOT of money. But, interestingly, we don’t feel “rich.” I think that comes from years of living like medical students. We didn’t actually upgrade to “living like a resident” until several years after completion of our fellowships. Currently, I would say we have loosened the purse strings quite a bit, but only in comparison to the way we used to live— not when compared to some of our friends and colleagues. We love eating out at nice restaurants, and we travel with our daughter as often as we possibly can. I lease a pretty sweet car for $400/month because I decided that the peace of mind in not having to worry about expensive/ time-consuming repairs on an older/owned car was worth it to me. It’s no Tesla, but it’s well-appointed and it fit within the budget with which we were comfortable. The point is, we’re quite happy with our standard of living, so the 50% of our income that goes into our investments is never missed. The only reason I have the above information is that 2004 was the year we started making an asset spreadsheet. This is an Excel file that we update once or twice yearly, usually at tax time. After reading a finance book and making our first spreadsheet, we set goals for asset allocation, realizing that we were WAY off. We had lots of cash but a hodgepodge of mutual funds in different classes. And so we learned to rebalance, which we now do every year (for us, always adding to classes in which we are deficient— not selling the ones where we are overloaded). Toward the end of fellowship in 2006, we were holding 32% of our portfolio in cash, in anticipation of needing a down payment for the house we would buy after training. It wasn’t until late in 2007, one year into our “real doctor” jobs, that we finally adjusted our cash goal down to 5% and got serious about making regular investment contributions. We started transferring tens of thousands of dollars into our mutual funds (right before the market crashed, I believe). This is also when we got some discipline and set up monthly automatic transfers from our bank account to our investments: $4500/month, divided among three mutual funds in different classes. And, of course, we were maxing out our 401k’s. We continued on in this fashion for several years, making automatic investments monthly. We had a baby and maxed out our state’s 529 fairly quickly (our state offers “credits” for purchase which, upon entry into college, will have a value equal to the cost of a four-year education at our state’s most expensive university). It took us quite some time to realize that one of two scenarios must be true: either our rate of investing was inadequate, as judged by the constant accumulation of cash in our bank account; or, our rate of spending was too low. Given that we were still comfortable living like residents (despite my wife complaining that her receptionist has a nicer purse than she does), we chose to increase our rate of investing. For the past four years, we have been automatically investing $20k per month into our taxable accounts. We rebalance the amount that goes into each fund once yearly to maintain our asset allocation (47% large cap stock, 18% small/mid cap stock, 15% international stock, 15% bonds, 5% cash). We continue to max our 401k’s, backdoor Roth IRAs, and stealth IRA’s (HSA’s) [hyperlink to WCI post]. We also put $1000-1500/month into the Utah Education Savings Plan— just in case our kid wants to go to Yale + med school. OK, so we’re good at saving. But if we’re thinking about retirement, what about our biggest recurring expenses? Have we adhered to WCI’s advice to get rid of the med school loans ASAP and not carry a mortgage into retirement? Um, not so much. We have $300k left on a mortgage (2.875%) that is scheduled to be paid off by 2025, two years after our planned retirement. We still have $200k of medical school loans (2.88%) that is scheduled to be paid off by 2033. We’re not thrilled about carrying these expenses into retirement, but we’re hoping that the return on our investments makes this a reasonable strategy. As for when to pull the trigger on retirement: the more we read about this issue, the more overwhelming it becomes, as there are a zillion variables to consider. What we’ve found helpful is to have our portfolio analyzed by different methods and then see if we get similar opinions. 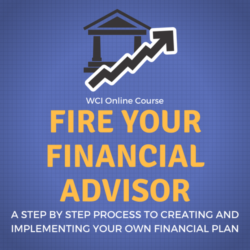 We’ve taken advantage of the free financial advising consultations through work, and we’ve also had a couple of portfolio analyses followed by video conferences with the Vanguard CFPs (a free service offered to those with $1 million invested with Vanguard). It has been reassuring to hear similar opinions from several different people regarding whether we are on track. I’ve also entered all of our data into Fidelity’s retirement calculator, a powerful tool that allows you to control all sorts of variables. As best as I can tell, retirement by 50 is almost a certainty, and we may even be able to wean down to part-time by 48. WCI, Mr. Money Mustache, and my parents all say that you need to retire “to” something, not “from” something. I know they’re right, but that’s going to have to be the subject of another post. I’ve got to get back to work. What do you think? Are you a super-saving doc? Do you know someone who is? Do you hate your job enough to save like this? Will you carry debt into early retirement? Comment below! Congrats to the both of you for the wealth you have built. You don’t say your age, but I will assume if you have been practicing for 9 years, maybe you are in your very early 40s. My only thinking is that a nest egg of $3,414,000 will provide $136,560 per year living expenses. I think you can both easily go part time today and still retire before you are 50. I guess it all depends what your yearly expenses are like today, and what they will be like in retirement. Thanks, Alex. We are both in our very early 40’s. You are probably right about us being able to go part-time sooner rather than later. As I (obsessively) enter our data into different calculators (I like cFIREsim currently, http://www.cfiresim.com/input.php), I am conservative enough to want to see a “100% success rate.” My thought process is, if we are going to pull the trigger on a very early retirement, we need to be fairly certain that we won’t be eating Alpo in 40 years. As for expenses, even though our living expenses are fairly low now, we expect to do a lot more travel in retirement. And even though we love our camping/hiking/kayaking trips, we also really like nice hotels and expensive restaurants. So I tend to build in cushion upon cushion when calculating our goals. I think shooting for 100% certainty of one’s portfolio and one’s portfolio alone lasting the whole time is overkill. One can always moderate consumption or, god forbid, earn some money even while retired to smooth out glitches in the matrix, as it were. Mr. MM has good advice regarding this. Toshi, you’re totally right. It is overkill. I continue to work on trying to adjust my mental outlook, responding more to logic (like yours) than fear. If you like the cfiresim calculator, I think you will love Firecalc.com It has more options, and more “what if” scenarios that you can play with. Basically in retirement your expenses are less, especially if you move to a state with no income taxes and you downsize your home(Florida). Learn what the marginal utility of wealth means!!!! In the metro NYC area it could be 25k/yr for a couple, ouch!! Ken, you raise a great point about preservation of capital approaching retirement. One of the aspects of financial management that has been tough for me to wrap my brain around is the dogma regarding shifting toward a much more conservative asset allocation as we approach retirement (like 50-60% stocks and 40-50% bonds). That may work for someone retiring at 65 with 15-20 years of life expectancy, but it seems like it is much more likely to result in portfolio failure for someone retiring at 50 with 45 years of life expectancy (longevity runs in my family). My plan, as we get within 1-2 years of retirement, is to hold about 4 years of living expenses in something very conservative (maybe CDs), but keep the rest invested in the neighborhood of 70-80/20-30 stocks/bonds. That way, if the market tanks early in retirement, we can live off cash while we wait for the market to rebound, and then start drawing down stock accounts again. The other thing you could consider is a “retirement” style allocation for a portion of your assets that are meant for basic living, and a “growth” style allocation for the rest of it. Your 4 years of cash plus an 80/20 allocation may end up being along these lines. I was discussing with a wealthy near-retiree recently what the asset allocation should be near retirement. If you have 10 million, it would seem a shame to me to allocate this as someone with 2 million would. If I felt I needed 2 million to comfortably retire, I’d consider shifting my allocation for that 2 million and put the other 8 million to work in a more aggressive allocation. Griva, I think you point out something that is largely overlooked. Once you exceed what you need for retirement, to me it makes the most sense to invest the excess aggressively. The more in excess you have, the more this makes sense. Almost all financial advice is geared towards the middle of the bell curve in terms of earnings and savings. Very seldom do we see advice geared to high income, high asset professionals. The middle of the bell curve group needs to carefully protect their savings. Bernstein et al are right to suggest that this group needs to be hyperconcerned with risking their retirement savings, as they have no margin for error to lose a bunch of it. However, if you have accumulated twice what you actually need for your retirement, why would it make sense to put it all in a SPIA, or a portfolio heavily weighted in bonds? What are you protecting against? Dr. Bernstein advises “very high-net-worth individuals (minimum portfolio size $25 million)” not the middle of the bell curve group. I was referencing his books. Asset allocation for retirement purposes that you regularly read about arent for everyone, and you have to understand why they are like that. First, the main reason and really only reason to have bonds in your portfolio is to smooth out the volatility. However, as you increase the percent allocate towards bonds you decrease the longevity of the portfolio. This is especially important given where bonds are now and that they have been on a decades long bull run. FWIW, the original Trinity study (the 4% safe withdrawal rate) suggested that the optimal mix was 75% equities/25% bonds and never more as its a drag on longevity and performance. Of course the principal matters and some will need more volatility smoothing than others. However, if you base needs are well covered than a higher allocation to stocks (than the age minus formula or 60/40, etc..) is warranted especially given longevity trends. Great post and very inspirational. IMHO – the combination of the high initial (and current) dual income, growth of stock market during that time period, and the high savings rate worked exceedingly well in this scenario. Congrats! jealous. I don’t have the money to do this with one lowly dentist income and a stay at home wife. The assets here are mind-bogglingly awesome. I wish them the best of luck and hope that their health allows them to enjoy a long fruitful retirement. I can’t see being able to leave this profession until 55…. hopefully I can move to part time at some point, but that can be hard to do. z, your point about health is something that weighs on me. I worry that all this delayed gratification could morph into totally abandoned gratification by some sort of life-changing health event. On the bright side, we don’t currently feel like we deny ourselves that much. But, there are certainly things we would like to spend money on now that we don’t, solely because the magnitude of the $$$ makes us squeamish. 1) Move to Iowa or Nebraska where you have no competition. 2) Become a complete practitioner (molar endo, extract and inserts, ortho and thirds too, at least a little). 3) Pick up speed and efficiency (enough to see 30-35 patients a day, treatment plan in about 10 minutes). 4) You can be financially independent in about 5 years’ time. This is a great post. I agree that I am jealous. I am an academic surgeon bringing home less than 1/2 of what he is investing each month. Plus, with student debt, life/health/disability/car/home insurance and rent, it only leaves a minuscule amount of money to live on. I am trying to put as much extra as I can toward the debt to be at my zero net worth, but I don’t see that happening for about 3 years for the zero net work and 5 years to be debt free (minus a mortgage we may acquire by then). That puts me (and many of my colleagues) at around 38 and finally starting to go into the green. I hope to pay off any mortgage in 15 years or so that way I am totally debt free by 50 at the latest. Congrats to people who have this financial freedom. I hear many stories about it, but it is just not reality in many peoples lives. But, I am still better off than my parents and aunts/uncles/grandparents who all worked construction jobs until they retire at 65 and hope their retirement will get them through. That said, sometimes the answer to financial issues is boosting income. That might be taking more call, working more shifts, negotiating a raise, picking up a second job, starting a business on the side, going into private practice for a few years before coming back to academics (tough move I know) etc. Having boosted my own income at least a half dozen times, I can tell you the best way out of many financial issues is to simply grow out of them. I completely agree. It is nice to hear from both ends of the spectrum to put things in context. It still amazes me we have such an income discrepancy between people in the same field, even in the same stage of their careers. In academia, much of it is luck of where you find a position or where your family is from. Some of my close friends are making 100k more than I despite being in similar years from graduation and doing the same subspecialty. I do appreciate all of your articles, including this one! I have learned much and have altered my mindset for the better on many things financial that I wish I knew when I started medical school. I would love to hear your thoughts on supplemental income for academic physicians. I cannot necessarily moonlight at other places, so that is out. I am salary, so no extra shifts. If you have an article on this and I missed it, could you link to it? Otherwise, an article or guest post would be awesome to hear examples of what people are doing. Even an extra 10k per year stream of revenue would be immensely helpful at this stage in my career. Keep up the good work! I had a partner who started his medical manufacturing business while working in academics. Although he later transitioned to my private group to give himself more time to do it, he eventually sold it for a very good profit and retired in his early 50s. First off, congratulations! You inspire me (a graduating surgical resident, already dreaming of retirement-Today’s Medicine is just NOT an environment that I find healthy or sustainable for a long and satisfying career…I too am planning on aggressive saving for early retirement). With that said, I cringe when I see your allocations, for someone who wants to retire in less than 10 years you are subjecting yourself with an 80% +/- stock portfolio to real risk which could wipe away your dream of early retirement if a true 20+% market correction happens in the next several years. I’m sure you have thought about this and this has been brought up by your advisors. Either you guys have a very high risk tolerance or simply are okay with not retiring early. What are you thoughts? Do you plan to allocate to something more conservative as you arrive at engaging retiring to something else? Thanks, TJ. I just typed out a response to Ken, a few posts above yours, about this very issue. I’d be interested in your (and others’) thoughts regarding maintaining this aggressive asset allocation for an early retirement. I have to say, I did not come up with this idea myself. I’ve done a ton of reading, and it seems like a conservative portfolio is much less likely to last 45 years than an aggressive one. WCI could probably explain this better than I, however! I think your high-stock plan is fine with the emergency living expense allocation. If you were feeling very conservative, you could always double that from 3-4 years to 6-8…enough to live through a depression (where you might find costs being less and able to stretch it longer). My plan has always been to accumulate my Number with aggressive investing/savings and then switch to a (mostly) all bond portfolio and live off of the interest. I would think you are close to that now, not even counting your aggressive accumulation for several more years. Do you or anybody have thoughts about that? G, I think that the likelihood of your plan succeeding would depend (partly) on whether you plan to retire early or at a more “typical” retirement age. If I were to switch to a mostly bond portfolio and retire now (early 40’s), my portfolio would be eaten away by (eventual) inflation + my fixed expenses (mortgage + med school loans), given the current low rate of return for bonds. Using any of the available retirement calculators (I like cFIREsim), you can plug in your asset allocation and get a great sense of how that portfolio would fare over the course of your life. Of course, if you have a ginormous portfolio and plan to retire at 65, you could put it mostly in bonds and do fine. My outlook for everything is pessimistic. Maybe that’s because I’m about to start a career in a field I no longer find passion in. Regardless, I personally cannot stomach high volatility, a lesson I learned while “playing with stocks” in medical school and loosing every penny of the $1000 I “invested”-that was then and since have discovered bogleheads and MMM and now passively invest in a 4 fund portfolio. I will have a high savings rate, but the future looks grim for the global economy-now NO one can predict the future, but if you start to look at the crippling student loan burden this country has combined with China’s growing economic concerns, I seriously would not be surprised to see a long and very dire bear market in the near future (something I would welcome since I’m 15-20 years from retirement)-So the short of it is, I keep a 50 stocks/40 bonds/10REIT and Futures portfolio. I think to each their own and if you can withstand KNOWING the potential for a severe bear market to cut your dreams of retirement in 7 years to now 15 years then great. Let’s be honest though, if you live according to MMM principals, you could totally retire today and be JUST fine-The determining factor in your plans is your fixed costs and how much you want to spend in retirement. TJ, your perspective and low tolerance for volatility is valid and shared by many. I’d like to use your response to make a point about risk tolerance and how it relates to asset allocation. If you adhere to a worst-case-scenario philosophy, then you will probably never want a substantial portion of your portfolio in stocks. But, if you think the outlook for the future is somewhere between the glory days of the past and the apocalypse (maybe 6-7% returns instead of 9-10%), then you might want to consider a more aggressive allocation since you are 15-20 years out from retirement. You noted that you would welcome a bear market this far out from retirement – I agree! A bear market now would be equivalent to a fire sale for you: buy as much stock as you can when it’s cheap, and reap the rewards in the future. But that philosophy only works if you have faith that the market’s past performance will, at least to some extent, predict its future performance. To the best of my knowledge, even accounting for the Great Depression (though this is controversial depending on how you do the math), the market has always recovered within about 4 years of a crash. One word—Diversification! And 50 stocks/40 bonds/10REIT is not that great in my opinion. Think of it this way, you’re 50% invested in an asset class that has been in a 7yr bull market, 40% invested in a 30yr+ bull market, and 10% invested in a 7yr bull market. Not going to be fun if/when these remain correlated during the next inevitable downturn. Good luck to those who don’t like vol and think they’re properly diversified. You certainly can be aggressively allocated to equities like the author, but the key is finding a true diversifier that actually MAKES money during the rare periods when equities falter (ie recessions/crises/deflation). There are plenty such diversifiers out there; please read, research and talk to people to find them and see what fits you best. Think in terms of diversifying over different assets classes, time frames, and strategies. Believe it or not, it’s possible to have a portfolio that is 60-80% allocated to equities yet have the portfolio never have a down year if you find the proper diversifiers. Once you stop having earned income, I’d keep 5-7 years in cash/CDs (and build up that cushion as you approach your retirement date) and keep the rest in your preferred asset allocation according to your risk tolerance, including 100% equities if you are comfortable with that volatility. Then, when the market crashes, come back to this site and Bogleheads if/when you need encouragement to stay the course. You’re correct. People are discounting you’re emergency fund, which I think is probably way too big anyway. It doesnt sound like you have a ton of largess to cover so I dont know why you’d need so many years worth, that cash is losing money/opportunity. If it was income replacement you are concerned about then I would keep the one years worth of cash, and invest the rest into something that I could use or live off the dividends when the time came. In all likelihood when some crash comes round it will still be worth more than when you started and throwing off cash to be used or reinvested. You could do a low volatility fund or something similar that grows but is less risky. Just seems you’re insuring for a super low probability event that youre not really at risk of due to your time until retirement and spending/debt habits. This is a great post and encouraging on a financial and retirement level. Being already retired with enough resources to support my desired lifestyle this got me thinking about something else. This couple have a lot of training, skills, and I bet desire to make a difference. Something (I bet the system) is taking the positive personal aspects out of their profession. How about in addition to the finance goals we or they try to change something to get that sense of satisfaction out of your professional activities. Perhaps this is a different opportunity for someone, I sure could use some of this myself. vulcan alex, you hit it right on. How to continue to utilize all this knowledge to make a difference, while avoiding/mitigating the headaches? Perhaps someone can write a guest post! Congrats on great personal finance! I would encourage you to come play on the business side of finance in your practices. Whether you own your practice and receive the full amount of your profit or you work for a group or hospital that profits from you, profit exists. Are you utilizing it in the best way for yourselves as you are doing with personal finance? After his stroke, my husband changed his mindset from gunning for early retirement to wanting to change his practice into what he envisioned he would like it to be so that maybe the rewarding part of medicine could be optimized. I don’t know what that will look like for you as you didn’t say your fields. But, you obviously are personally financially fit to go down this road if you desired. For him as a solo ophthalmologist who owns his practice, he started by adding new procedures that were interesting and exciting to him that were underserved in our area. He is looking into adding a “scribe” to help deal with the EHR he finally went for. He is considering adding an optometrist who he would supervise (for some of you that might be a NP or PA) who could allow him to focus on what he likes about ophthalmology. He would add them with the intention that they would supervise a small optical. So, basically trying to turn medicine into multiple income streams beyond just his direct sweat work. He approached our hospital and they are gladly replacing the old phaco with a new model. They will market it and him without financial outlay from us. We never bought his office building because their rent was ridiculously cheap. And, while we still don’t want to pursue owning a building, he is negotiating more and updated space with them to do what he envisions. This path has invigorated him. We are being as careful with our business numbers as we have been with our personal. Having made good choices like you and your wife has allowed us to explore the option of recapturing the love of medicine instead of just gunning for early retirement. Should be an interesting ride. Best wishes to you and your wife for continued success and much happiness! Dr. Mom, very inspiring thoughts. Thank you. Inspiration is nice. Action is better. I would challenge you to think about how many people have jobs, health insurance, their own 401k’s, etc. because of the work you and your wife do. I assure you many of them realize your roles although you may not see it that way. I would submit that many of your ancillary staff would be grateful to help you change your practices into something that fulfills you more. Try to see your connections not just to your patients but to the employees supporting you. Can a little less highly marginally taxed income be turned into tax deductible business expense that would help you be happier and more fulfilled in your practices? That’s an impressive savings rate; congrats on having the discipline to manage that. I think there are plenty of things to retire to…maybe teaching, volunteering in an underserved area, or working with a certain patient population. We all had an idea of what we thought practicing medicine would be like, and unfortunately reality doesn’t always match up. It seems like you’ll be in the fortunate position of being financially independent, so you’ll not be beholden to anyone but yourself. If I was in such a position, I’d tap into that young, naive, idealistic person I was before I started medical school, and try to make those dreams a reality…so I could have more of those rewarding moments. This is exactly what I need to do in retirement, in order to feel productive, and like I am adding something to the fabric of society. For all the BS in medicine nowadays, I still love making that connection with patients who actually want my advice (as opposed to the ones armed with Dr. Oz’s and Dr. Google’s advice, demanding I follow the treatment plan they have already meticulously researched). I agree and this is what inspired me and how I envision my own “early retirement” in less than 2 years at age 40. Why not achieve financial independence as quickly as possible? There is no law that says that you have to retire completely (or quit working at all if you don’t choose to). You can simply work on terms that you are comfortable with and choose not to deal with any of the B.S. that you decide is not worth it. I really enjoyed reading your post and congratulations on your financial success! Strong work! Tough to criticize, but it seems you are putting all your eggs in one basket. How about some real estate/land/rental properties? When/if the market comes crashing down, you are going to really feel some pain! We’re similar to you, 9 years out and dual income physicians with high savings rate. Our portfolio is larger and we diversify with real estate and land. RG, valid point. If we ever venture out into that arena, it would have to be REITs (do you purchase individual properties, RG, or REITs? ), as we have zero real estate savviness and little energy to devote to getting savvy. And I probably don’t have the right skill set to be a landlord. For those who understand real estate and land, diversifying in that fashion may be a good idea. As for feeling pain when the market crashes, I am hopeful that my strategy (once in retirement) of maintaining about 4 years of living expenses in something like CDs will allow us to ride out (inevitable) crashes by living on the cash, and then rebuilding that cash buffer by selling stocks during the (probably inevitable) recoveries. So I read that link and found it to be a little odd in that his description of how reits work, make money and grow was off and misinformed. That is not how they work, yes they are much like stocks and they have been bid up in this environment of ZIRP and yield chasing, but they have their place. Also the scenario of hyperinflation being bad and how that affected his REIT reasoning didnt make sense. Its bad for everything, like market risk and isnt particular to that asset class so it seems unfair to penalize it for that reason. Not too mention we’d be lucky to have some sort of inflation due to debt/demographic trends in developing countries so that seems a bit out there. The economist fellow couldnt find data for re returns before 2000, and while Im not into that stuff whatsoever, I know that there is literally tons of data out there going back to europe in the 1500s at least (and real estate mostly is in line with inflation over long term), and then he falsely equated RE like a person buying a house to REITs which grow and expand by buying, locking in leases, interest rate spreads, selling and even co-owning and participating in underlying business profits (mostly in senior care facilities and their associated REITs). REITs=/=buying real estate yourself, couldnt be further from the truth. Robert Shiller has a good chapter on historical RE returns in his irrational exuberance book and maybe on the web somewhere. This is not an endorsement of REITs per se, but just that there is better information out there on the asset class that isnt predicated on doomsday scenarios and misunderstanding how they make and distribute earnings. REITs are equities and part of your stock allocation and not some quasi bond or fixed income security. Zach, thanks for this comment and all the other insightful comments you made on this post. I am pretty sure you have a greater depth of understanding of REITs than I, so it looks like I need to do quite a bit more reading to comprehend the nuances. I guess my main takeaway from jlcollins’ post was that I wasn’t sure REITs offered me much more diversification than I already have. That said, I do have REIT exposure in my 401k/profit sharing accounts, so I’m buying them whether I intend to or not. Just one more question for you, if you are still following this thread: what’s your background (finance, medicine, both?). Go curry cracker website has a great analysis of this situation (http://www.gocurrycracker.com/path-100-equities/). He says 100% equities for early retirees (age <50 with long life expectancy ahead) is the best way to go (although he himself still holds ~10% bonds). The main point is BE FLEXIBLE. You have a cushion, and I think 4 years is adequate. But if you imagine a pessimistic scenario where the market is in a prolonged slump, dont you think your frugality muscles will kick in and that cushion could be made to last a little longer? Thanks for the post and I'm shooting for your levels of success! This post gives me hope. We have just started our post residency journey a couple years ago and are investing about 12k per month on 1 physician salary with a stay at home parent. We were lucky to have the WCI blog available when we started so I think it gave us more focus. We are using a core 4 asset allocation. Off topic, @WCI, what do you do with the water bag after you get down? Just leave it there? M – Great job. I share the small concern expressed by a few others about the 90%(?) allocation to stocks. There is the thought of “after you’ve won the game why keep playing it?” (Dr. William Bernstein) although the ongoing cash infusion serves as a stabilizer. I think that, if I were to follow Dr. Bernstein’s prescription now (move assets into a very conservative allocation), assuming that I have already “won the game,” I would probably run out of money over the next 45 years. That being said, he is way more knowledgeable than I, and I do think he is right on the money for folks who plan to retire at a typical age. M – I’m familiar with those three sites. Their cases don’t apply to you. They advocate a high equity allocation because they want to stretch a 4% withdrawal rate for longer than 30 years. A lower withdrawal rate will require a larger stash and a later retirement date, which detracts from the message. I trust Dr. Bernstein more. As you know the withdrawal rate and the sequence of returns have a much larger effect on portfolio longevity. The asset allocation not so much. You are not looking for an exit as soon as a calculator says you can. You don’t need a 4% withdrawal rate for 50 years. You don’t have to count on market recovery in 4 years. At a more reasonable withdrawal rate, you will not run out of money in 45 years if you have a less aggressive allocation. A high equity allocation can actually decrease your success rate because it magnifies the dispersion. Harry Sit, thanks so much for your comments. I just found out (from a later response down below) that you are the Finance Buff. My apologies – I knew you by reputation but not by name. If you wouldn’t mind expanding on your comments, I’m not sure I understand why the sites I mentioned do not apply to me. Seems like those guys are talking about spending a tiny amount (per year) of a relatively small portfolio, while I am talking about spending a larger amount (at least 150k per year) of a larger portfolio. Like them, I am also looking to stretch that portfolio 45 years. To me, the concept seems to apply, but I may very well be missing something. Appreciate your time. The similarity stops at covering the same number of years. With a larger portfolio, and the ability to earn a decent income through part-time work with great satisfaction as Jeff suggested below, you have several advantages. Therefore you don’t have to push the risk slider as far. They have to make 4% work. You don’t; 3% will do for you. When 4% has to work for 50 years, one has to take more risk. When you only need 3%, you don’t have to take as much risk. Risk is called risk for a reason. He’s not retiring today, and its highly unlikely he’s going to suddenly change into a spendthrift when he does. Dont forget to add in a huge infusion of extra fodder for every year they choose to keep working. At the rate he’s going even chained to inflation the 150k would be much less than 4% already, and this is not taking into effect the power of reinvested dividends and plain growth over time when not sucking the portfolio down like its going out of style. For their longer, and well covered retirement a heavier equities allocation will last longer and grow more, probably so much so they can reliably spend the dividends thrown off in a few decades. He has an immense emergency fund he could live off in hard time or simply invest at those hardest times magnifying the outcome. Long term stocks out perform other asset classes and research has shown this to be true. Its not a one size fits all. Harry, can you support some of those comments? They seem to be different than what the evidence would suggest. Lets look at the Trinity study, and the Cooley table part of the Trinity study. We see the failure rates climb dramatically with very conservative asset allocations over the longest time frames. The OP is looking at a 50 year retirement, and has suggested that he will spend more in retirement than he does currently. That could well mean that he IS spending 4% of his retirement savings ($6M x .04 = $240K), or even more. IMO, the OP is correct to believe that his asset allocation needs to provide for growth. The OP has not suggested that he wants to do part time work if his assets dwindle. Just the opposite, he has suggested that he wants to work until he reaches a place where he is comfortable that he won’t work again. Respecting his words, he is looking for the asset allocation that gives him the highest likelihood of success. I would suggest that this allocation is neither his plan of 90% equities, nor your suggestion of extremely conservative. I would suggest an allocation from 25-75% equities would be most ideal. Bob K – To be clear I’m not suggesting anything extremely conservative such as < 25% in stocks. I agree with you that an allocation from 25-75% equities would be better, and maybe even more toward the upper part of that range. That's why I said it was only a "small concern" about 90% in stocks. William Bengen’s research seems to indicate a stock/bond allocation of 75/25 as optimal for long term withdrawal rates ~4%? I suppose if you only need 3% that ratio would be less. Yes, but that is dependent on the future resembling the past. My assumption was that it was a sketchy top rope anchor and that he’d be climbing back up that face and heading home with bag in tow. I can’t imagine WCI leaving gear somewhere. That’s scary. Don’t spring a leak! 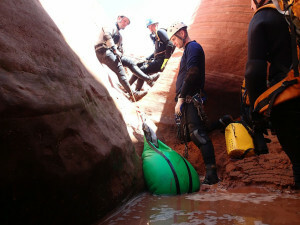 Yes, it’s pretty cutting edge canyoneering technique. And when you’re on the cutting edge, well, sometimes you get cut. That said, like climbing, it isn’t as dangerous as most non-climbers think, although far more dangerous than most beginning climbers who have too much faith in the safety systems think. Best question of the day. This is pretty cool. You EMPTY the water bag from 50-300 feet away and pull the now empty bag over the cliff behind you-essentially leaving nothing in the canyon behind. No trace you were ever there. Any thoughts regarding “converting” taxable Bond holdings and paying off loans? Immediate 2.88% return which probably approximates your bond yield. Also takes one of your long term fixed expenses off the table. Thomas, now that is an interesting idea – I hadn’t thought of it. Since I plan to hold 4 years of living expenses (while in retirement) in something like CDs anyway, I might not need much of a bond buffer right now. So I suppose the question is, is it better to allow my current bond funds to compound, or should I take a lump sum and demolish the med school loans right now? I honestly don’t know the answer to this one. I’d appreciate other thoughts/comments. Don’t forget you are getting dividends the whole time. Maybe not as the average, but all the S&P500 companies will still be making money. If I were in your shoes, at retirement I would pay off the house and student loans in exchange for keeping less bonds in your portfolio. Then again, I have been reading Bogle and Buffett and they both seem to detest holding too much in bonds. Also, keep in mind that by paying off debt, you will less fixed expenses and therefor you will require much less money in your emergency fund, or the 4 years in CDs fund. Think about it, if it currently costs you $3K/month to service your debt, 4 years of that is $144K which sound to me about 1 years expenses. Maybe for someone who is so risk averse as yourself, paying off low interest rate debt is a good idea. I second this suggestion for paying off debt with money in VG Intermed Tax-Ex Bond. Good article too, interesting perspective. Very impressive savings rate, congratulations! Does the kid know what kind of assets you have built up? I wonder if that information would be inspirational or demotivational to them. I had some “rich kid” friends who didn’t bother to save, living paycheck to paycheck, because they believed their inheritance would more than cover their own retirement as well. J, you totally nailed one of my greatest fears. We have tried very hard to instill our work ethic in our kid. So far, so good. She’s a great student and seems to understand the need to work hard. She is probably spoiled (objectively speaking), but she doesn’t act spoiled (yet). I have started educating her about the power of saving/compounded interest, so she now has her own Vanguard account (she decided to put the money that was in her bank account into the Total Stock Market Fund). J, a couple more thoughts. One, I forgot to answer your question: no, she does not know how much money may be coming her way in the future. I don’t think she even knows about the concept of “inheritance.” Fortunately, the people in my family tend to live into their 90s, so she’s going to have to make her own nest egg or starve, if her plan is to wait for us to kick the bucket. Second, we’ve tried to instill the concept of “value.” So, she knows that we don’t spend lavishly on things that don’t have value for us. I hope she internalizes that. We also make sure to do a lot of family activities (like camping and hiking) that do not revolve around expensive vacations (though we do take expensive vacations). Way to go on the savings! I have question on the loans. Did you do this because an advisor suggested? I can see it being a benefit for asset protection (ie law suits etc). I would also think you had a better return vs the interest rate of your loans? Would anyone else be kind of enough to comment on the benefits of this method? SouthDakota, the truth is that “inertia” is the initial reason for carrying the loans in this fashion. We have just been doing it this way for so long that…we’ve kept doing it this way. But, we have been able to invest the money that would have gone to paying down our loans faster, and that has resulted in some pretty serious compounding over the years. Over the past 10 years or so, our portfolio has returned something like 9.3%, allowing us to accumulate wealth faster, while we make our monthly loan payments out of our paychecks (remember our loan interest rates are about 2.8-2.9%). We have actually never asked an advisor about this issue which, now that you mention it, seems like an oversight on our part. As for asset protection, I’d love to say that carrying a mortgage is my clever way of practicing asset protection, since the homestead exemption in my state is pretty minimal. But, alas, I am not that clever. But it is a side-benefit, I guess. Great post, and with just a couple years left of residency you essentially did what I plan on doing! How did you guys handle those two 6 figure student loans while also prioritizing investing? It seems like you had a fair bit invested/saved while you still had sizable loans. I can never figure out how to prioritize debt pay off vs savings! DrJD, for awhile after med school, we were paying interest only on the loans, which was helpful to allow us to invest simultaneously. It also helped that we did residency in a very low cost-of-living area. Think: the best sushi in town was pre-made on the shelf at the grocery store. Fellowship was done in a higher cost-of-living area, but we were accustomed to “living like medical students,” so we were able to pay off loans and invest a good chunk of our paychecks. Great article. You are certainly conservative in your planning. You have $3.4M now, and you will be saving $300K a year for another 8 years. That takes you to about $6M with zero growth. Currently, you live on about $150K a year. Those numbers point to an abundance of safety, in terms of running out of money. While it is true that you may well spend more money for the first 10-15 years of your retirement, it is highly likely that after that you will experience a steady decrease in your expenses for the rest of your life. And about the time you start spending less, you will pick up social security to significantly supplement your income. When you are plugging in your financial projection numbers, be sure to plug in the decreasing expenses, as it will significantly impact the safety of your plan. There is decent research in this area, but my belief is that the 2% or so decrease that is commonly considered normal for declining expenses, actually significantly understates the decline for high net worth retirees. This is because most people can not decrease the vast majority of their expenses (housing, food, utilities, etc, so it understates how much less people spend on recreational activities many years into retirement. High net worth retirees have a much higher percent of money being spent on luxuries/recreation, and have a higher decrease in those expenses over the years. Bob K, excellent points. We are over-conservative in exactly the way you describe. It’s more for our mental comfort than actually being logical. One point: our social security payouts may be quite a bit lower than folks who work longer. I have not done the formal calculation yet, but I think it may wind up in the low 20k’s (each) per year. And yes, recreation expenses should go way down once we accumulate some more diagnoses in our advanced age. Nice post. I’m saving around 45% of gross pay and watching my net worth increase. I’m still under $1M but as the taxable portion increases (401k/IRA space maxed) I’m getting more worried about asset protection. I’ve got med mal coverage,and some umbrella insurance on top of home/auto, and my riskiest asset (I think-but I also have 2 kids) is my car. So, perhaps it’s for another post but I’m curious what sort of asset protection or estate planning you have. We are planning to meet with an attorney soon (my wife wants to get wills, etc since we have small kids) and that makes me nervous too-because I don’t want to get sucked into expensive legal services if I don’t need them. AG, I have read a fair amount about asset protection, including everything WCI has written. The bottom line for me, in my state: the options are not awesome. I have the same basics as you do, for the time being. I do plan on sitting down with an asset protection attorney this fall, just to see what I may be missing, as the thought of having a multi-million dollar judgment against me is frightening. If you have kids you need them. Go get a will yesterday. Don’t be penny wise and pound foolish. Yes, definitely. Did not mean to imply that lack of great asset protection options = don’t make a will. Everyone needs a will. Poo-poo and I thought investing 3000 to 5000 a month on top of my 401K, I was doing good. This article puts me to shame. I wish I had the courage and income like you. 20k a month, isnt that like 70-80% of your income? Amazing simply amazing. Lately I have indeed relaxed a little to help with the environmental costs, like geothermal, solar etc, just to decrease my carbon footprint. There is a couple of things that strike me about your post. First of all, OH MY GOSH you have a ton of money saved….great job. Now, your quote, “But, interestingly, we don’t feel “rich.” I believe this the whole purpose of the book The Millionaire Next Door and Dave Ramsey’s show and WCI is to change peoples attitude about what rich feels like. What you have is what “rich” feels like. Second comment is that you make almost $600,000 a year and you don’t like your job. Wow, this baffles me. You have plenty of FU money. All this money talk is suppose to be gravy on top of a profession that we love (okay, maybe like). I would think loving our job is paramount especially when it comes to health care. I am way behind you in terms of retirement but I can tell you I feel so much richer than you because I love coming to work everyday. I mean it is work sometimes but I love it. I have a friend who was 41 when he looked at his portfolio saw he had enough, so he reduced his patient time in half and started helping the hospital with the business/leadership side of things. He took a big pay cut but he slowed down and gets a lot out his new job. I like the slogan from Life is Good…. Do what you love. Love what you do. And lastly, enjoy your money. Go spend some. I am talking about going crazy once in awhile. Go buy those cool shoes you have always wanted. Go to the Vineyard Vine store don’t even go the clearance rack. Or how about this Give it away….talk about going crazy. John, that is awesome that you love your job. I envy you, seriously. I still love the intellectual aspect of medicine, and I love when a light bulb goes on over a patient’s head while I’m explaining something. Your point about reducing patient time is well-taken, and I am looking at this more seriously now. I may be a little lost here. If you have $3.4 million in assets and are saving 20K/ per month plus maxing 401Ks, how are you coming up with the retirement date? How much do you really need to retire? If you retired today, using the 4% rule you would have 136K adjusted for inflation for life. That seems like quite a good amount of money to live off of and with your lifestyle would be easy to live off of. The other option would be to go part time for both you and your wife. I am an ER doctor with two younger kids. I sell off shifts to younger and less frugal docs and spend time with my family and doing the things that I want to do.I work about 9 days a month. I guarantee you will like your job a lot more when you get rid of weekends, calls, extra patients, etc. Both of you should strongly consider going part time and retiring sooner. It was the best decision I have ever made. Rob, you’re not lost – I’m just really conservative when I plug numbers into retirement calculators. Because I have been worried about making the portfolio last 45 years, and because I expect lower returns than the 9-10% I have been seeing, I have used withdrawal rate numbers closer to 3%. I have also built in other safety cushions that would seem silly to most of you if I detailed them here. Basically, I’m the guy who gets to the airport 2-3 hours early for his flight. Also, I expect that, for part of our retirement, we may be spending 150-200k per year, due to travel plans. As for going part time, I have been thinking about that a lot. I actually wrote this post about 3 months ago, and I have since realized that many of my assumptions are overly conservative, and I could go part time sooner rather than later. For me, working 9 shifts / month makes it where I actually like my job. What always was tough for me was the late shifts and long runs of shifts. Without those aspects, the job is more enjoyable. If you’re really disliking your job that much, you need to reassess what’s important. It’s made my career better and I’m likely to have more career earnings since I don’t dread work. I’d seriously consider it for you and your wife while your daughter is young. I think the question of leaving money to your kids is interesting. Conventional wisdom seems to be to make them self reliant, and ideally for them to be ultra savers, too. I am not sure I agree with this thought, at least not to its full extent. I have 5 kids, and I would like to be able to provide security for their retirement years. Obviously I want them to be thoughtful with their money. However, I am not sure I want them to make sacrifices all their lives, in order to ensure they are OK in retirement. Perhaps that means that they buy a wakeboard boat in their 30’s, when their kids are young enough to enjoy it for many years. Perhaps it means they stay at a job that they love, instead of moving “upward” to a better paying job that won’t be as fulfilling. Perhaps that means they go to all their kids events, and coach their teams, and are present emotionally all the time, because they are not stressed about money constantly. The pursuit of money, even for the purpose of saving it, is not the perfect recipe for a great life, IMO. I hope my kids can achieve a good balance. If I leave them each enough money to ensure a reasonable standard of living in their golden years, that seems like a good thing to me. I realize I am generally in the minority with these thoughts. I agree with you on this. We don’t see anything wrong with helping our kids in the future. They won’t grow up thinking the financial help will always be there, but we’d gladly give it to them if they need it.